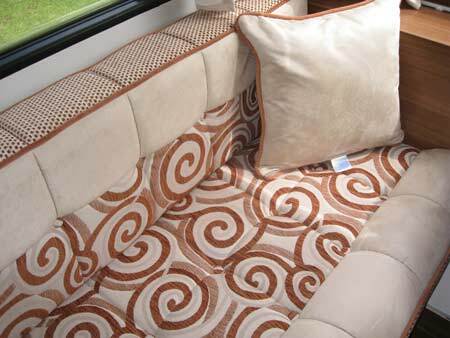 We saw the 2013 Adria caravans recently and took a close look at the baby of the range, the Altea 390 DS, Shannon. It’s certainly lightweight yet it has a number of practical features including the new Truma S3004 space heater which we liked; it is a more modern design with easy-to-see symbols and the ergonomically shaped control panel knobs are raised to make it more user friendly. In the living area, the wardrobe is situated above the heater and there is the usual storage under the sofa and an open storage rack over the one piece front window, complemented by overhead lockers. The soft furnishings are contemporary with a touch of suede and there are blinds and lined curtains to all the windows. The kitchen is fitted with matt cream worktops, a Thetford 91L fridge with a rather snazzy black door, a three burner Spinflo gas hob, with an oven and integral grill. It’s not short of cupboards and drawers either and the roof light makes the area seem quite bright. The shower room is opposite the kitchen and is well fitted with a good range of cupboards; some might say it’s a bit claustrophobic but given the body size of the Shannon it is perfectly usable and easy to dry. There are sleeping quarters for two at the rear of the caravan, and overhead lockers too and we loved the cute light switches with pictures of elephants on them! We expect that many people will use the table here rather than the freestanding table at the front. 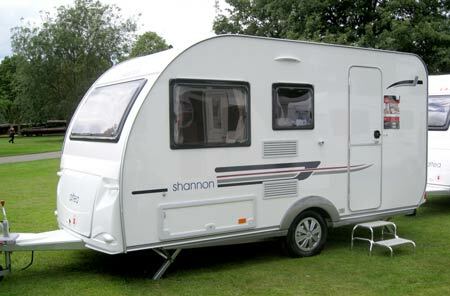 The Altea Shannon is built on an AL-KO chassis and has steel wheels so it hasn’t got the added caravan security of AL-KO Secure nor an alarm but production models will be fitted with an AL-KO AKS stabiliser. 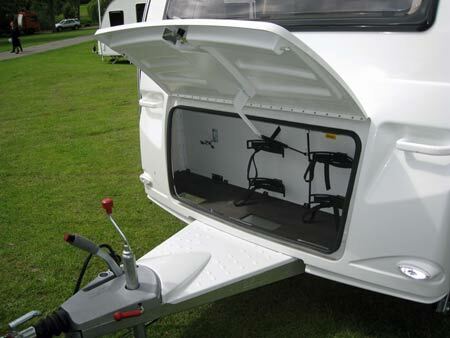 The lack of standard security won’t affect your ability to obtain insurance for this caravan given its sub £12,000 price tag but it still might be worth considering fitting a simple alarm to get a bit of a premium security discount. The body shell is Polyester and the new style graphics are simple but not too bold. We did like the LED awning light and the optional removable wheel arch cover. The gas bottle locker will take two cylinders and a spare wheel. 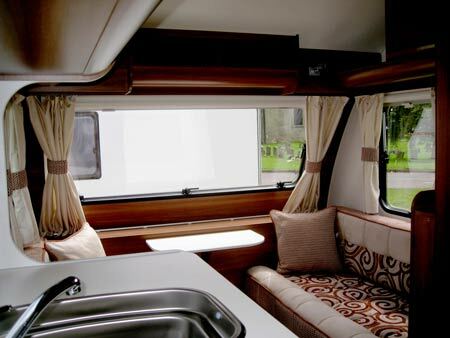 A practical, stylish and modern layout, perfect for a family and yet ideal for couples as you could leave the front end beds, or even the double bed, made up and use the rear end for sitting and dining. The vinyl floor covering may need a rug with a non-slip back especially in cool weather but at least vinyl is easy to brush or wipe clean! Recommended Retail Price: From £11,490.00 ex-works and includes VAT @ 20% but excludes a recommended retailer delivery charge of £495 including VAT. 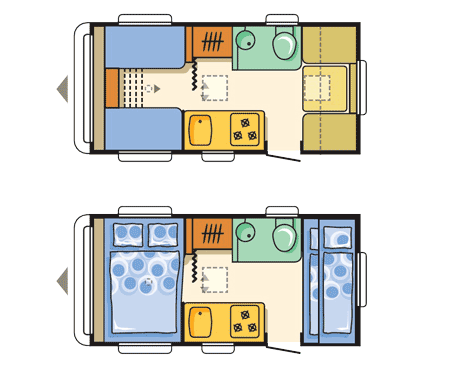 *Caravan insurance cost based on Adria Altea 390 DS Shannon, £11,490. Fitted with hitchlock and wheel clamp. Kept on drive at HX4 0BE. Caravanners over 30 years old, claim free for 3 years and a member of a caravanning club. Quote includes 10% online discount and 6% Insurance Premium Tax and is correct as of 23.07.12. 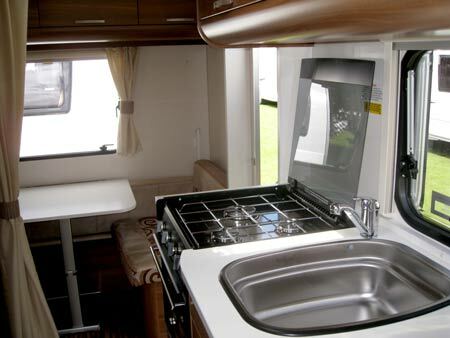 This Altea 390 DS has an ideal layout for either a couple or a family of upto 4. It is also very space and weight efficient. I really do think other caravan manufactures should consider the fact that not everyone wants or can benefit from a fixed bed caravan where it is necessary to push past this bed every time you need to access the toilet facilities. In the Altea the toilet is sited in the centre of the caravan. This is ideal when more than a couple are on holiday together. It concerns me that the width of modern caravans are now approaching 2.25m. The Altea is a more safe 2.07m. This is a great product at a good price that deserves to be a success. All it needs is a spare wheel.